Dedication: November 23, 2013 at 3:00 p.m.
Newport’s newest landmark is located at the corner of North Main Street and Belknap Avenue on the Richards Free Library grounds. It will be dedicated on November 23, 2013 in celebration of the 150th anniversary of Thanksgiving. 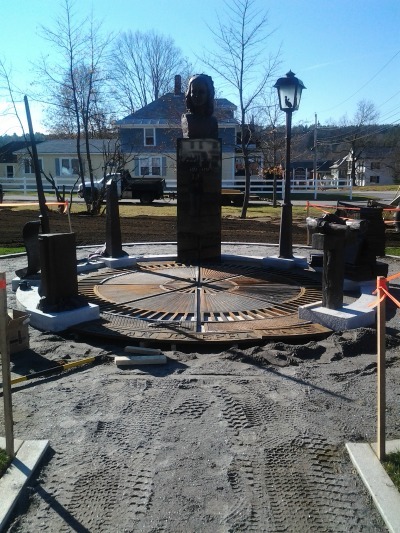 This permanent historic monument honors the legacy of Newport native Sarah Josepha Buell Hale (1788-1879) and has been designed to be both educational and contemplative.Â From this small New Hampshire town Sarah J. Hale grew to a position of influence felt acrossÂ the nation. Through her editorship of the Boston Ladies Magazine and American LadiesÂ Magazine and Godeyâ€™s Ladyâ€™s Book (1828-1877) Mrs. Hale promoted the education of womenÂ and the importance of their role in society. The author of seventeen literary works and theÂ editor of twenty-nine, she nurtured the careers of such notables as rances Hodgson Burnett,Â Catherine Beecher, Edgar Allan Poe, Nathaniel Hawthorne, and Oliver Wendell Holmes.Â Her contributions to American culture include completion of the Bunker Hill Monument,Â spearheading the drive to save Mount Vernon, and establishing the Boston Seamanâ€™s AidÂ Society which still exists over 180 years later. Her greatest achievement was a successfulÂ campaign to establish Thanksgiving as a national holiday. – The central component is aÂ bronze bustÂ of Mrs. Hale atop a black granite pillar, symbolizing the black clothing worn during the fifty-seven years of her widowhood. – An obeliskÂ represents the Bunker Hill Monument which was erected to commemorate that significant battle of the American Revolution. The Bunker Hill Monument Association began the project in 1823 but it lagged until Hale became instrumental in its completion nineteen years later. Â – A column of booksÂ bearing the titles of all of Hale’s works represents her contribution to American literature. – Haleâ€™s seventeen year campaign to have Thanksgiving declared a national holiday is commemorated by a pen and scroll and Â represents President Lincolnâ€™s proclamation that Thanksgiving be celebrated yearly on the last Thursday in November. 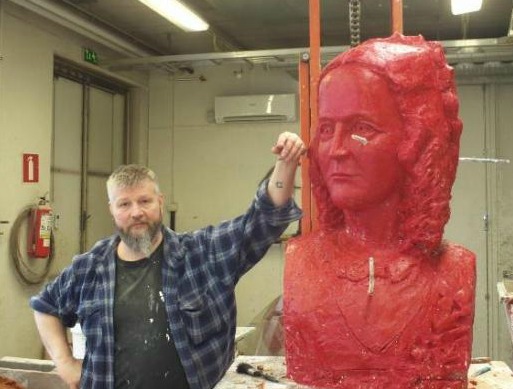 Sculptor Jari Mannisto is one of the most distinguished contemporary sculptors in Finland. He has had a large number of solo exhibitions as well as group exhibitions in Finland and Europe.Â In 2011 his sculptureÂ Family Tree,Â a memorial to Newportâ€™s Finnish immigrants, was installed in front of the Newport Senior Center on South Main Street.Â His latest project has been a series of bronze sculptures at Virkkalanpuisto Park in Helsinki, a joint project with the well-known American sculptor Robert Wilson. Jari works with a range of materials including bronze, granite, steel, wood and glass. He graduated from the HÃ¤me Polytechnic Art and Craft College and also studied at LahtiPolytechnicCollege.Â He is a teacher at the Vanaja Art Institute.